In 2012, the Palestinian artist Khaled Jarrar created postage stamps from Deutsche Post of the non-existing State of Palestine as one of his contributions to the 7th Berlin Biennale. Furthermore he marked the passports of tourists with an entry stamp of his homeland. Jarrar’s passport and postage stamps express the story of a state-to-be. Instead of continuing again and again the discussion about a one- or two-state solution, using these stamps is a simple gesture that helps to create normality. Together with Khaled Jarrar, the Istanbul based team of InEnArt will revive this art project and bring the stamps in circulation again utilizing the Deutsche Post AG service called “individual stamp”. This is not only an appreciation of Khaled Jarrars work as an artist but also a support and spread of his gesture and its political message. 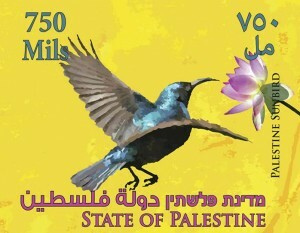 The stamps central and attractive element is the Palestine Sunbird. It stands for the wish to create an open, independent country that guarantees freedom to everyone to carry one´s life in one´s hand. During the Biennale, over 20.000 stamps were produced and sold to be send on mails and postcard worldwide. The postage stamps were already sold out during the Biennial in Berlin 2012. In the light of recent events, we reported about Khaled Jarrar´s current situation of being denied exit from the West Bank to attend an exhibition at the Whitebox Art Center in New York. 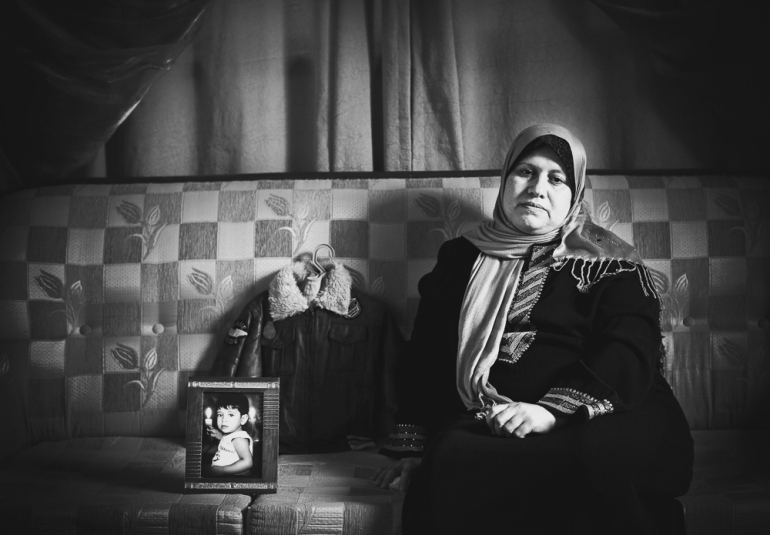 This case reminded us on the importance of Khaled Jarrars project from 2012 that issued the absence of a legal Palestinian state and consequently the freedom of movement of its citizens. 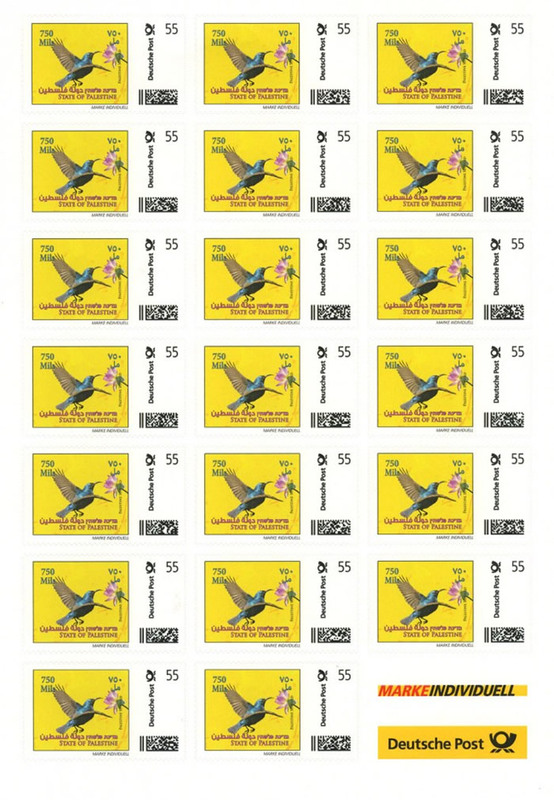 Against a small surcharge, the standard stamps of 0,60 Euro were produced with the “individual stamp” service of Deutsche Post AG and are valid for regular mailing. One sheet of 20 stamps costs 25 Euro (including shipping fee). Stamps are sold by sheet only. The stamps can either be seen as collector´s item or fulfill its actual purpose as stamps. Khaled Jarrar is a Palestinian artist whose first exhibition took place in public space at the checkpoints of Hawara and Qalandya. 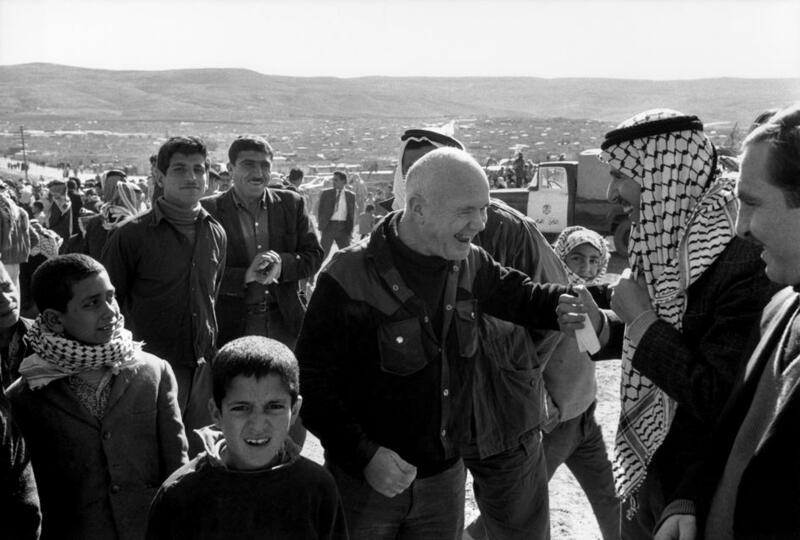 He lives in Ramallah.